No one reaches the heavenly Jerusalem except him who is on the way, although not everyone on the way shall reach it. To be a Catholic Christian is to be on the road and walking in the way. And if through some snare of the enemy, he be led astray from the Catholic Church, either into heresy or whatever other kind of superstition, he has already lost the way and returned to wandering. 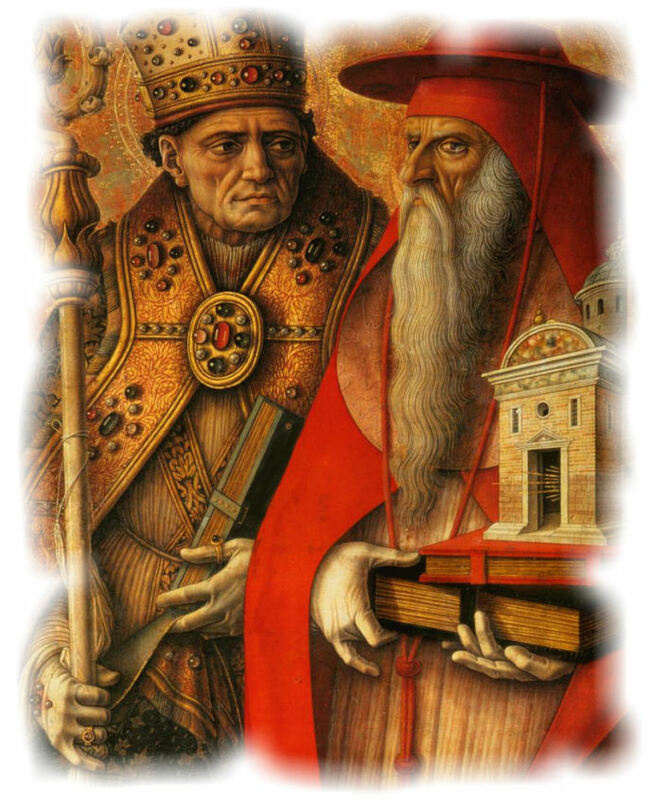 Because we fight for the unity of the Church, let us not concede to heretics what we know to be false, but let us rather teach them that they cannot attain salvation unless they come unto that same unity. The Church is a ship, and even if the ship is in difficulty, it is necessary that we at least be in it. So certain and so clear is the Catholic faith as expressed in these words of the Apostolic See, so ancient and so well established, that it would be a sacrilege for any Christian to doubt it. Heresies are embraced only by those who, had they persevered in the faith, would be lost by the irregularity of their lives. When the Lord said "He will convict the world of sin," the sin is none other than that they have not believed ... He sets this sin above all the rest, because while this sin remains they are held fast in all the others ... Therefore, let mankind believe in Christ in order that they may not be condemned through unbelief, by means of which unbelief they are held fast in all other sins. God wills all men to be saved and to come to knowledge of the truth ... This being the case, unbelievers certainly act contrary to God's will when they do not believe His Gospel. There is no one so far removed from God as a heretic! Hold fast, then, brethren, to the true, the genuine, the Cath- olic faith. This is our faith: the true faith, the right faith, the Catholic faith which comes not from private judgment but from the testimony of the Scriptures; not based on faltering heretical rashness but on Apostolic truth. Whoever is outside the Ark of Noah will perish in the flood. The contemporaries of Noah would not believe in his warnings as he was building the Ark, and thus they became frightful examples for all posterity. Christ our God is now building His Church as the Ark of Salvation, and is calling upon all men to enter it. If anyone holds to a single heresy, he is not a Catholic. If a man departs this life without the faith, in vain do his friends have recourse to acts of kindness such as prayer for him. The sacrilege of schism surpasses all wickedness ... It is not easy for there to be anything more grievous than the sacrilege of schism, because there is no just necessity for severing unity ... We say that you heretics are all guilty and wicked by the crime of schism. From this most heinous sacrilege not one of you can say he is innocent. Whatever is said in the Holy Scriptures concerning Christ can just as well be said concerning the Church! So that you may understand that the Church has received the keys to the kingdom of Heaven, hear what the Lord says ... to all His Apostles: "Receive ye the Holy Ghost," and then immediately following: "Whose sins you shall forgive, they are forgiven them; and whose sins you shall retain, they are retained" (John 20:22-23). These words relate to the keys, of which it had been said: "Whatsoever you shall loose on earth, it shall be loosed in Heaven" (Matthew 16: 19) ...A nd outside the Church, nothing is loosed ... The charity of the Church which is poured forth in our hearts by the Holy Ghost forgives the sins of those who are partakers of it. Of those who are not partakers, it retains. The grace which comes through the faith of Jesus Christ belongs only to those to whom the faith belongs. He who does not believe remains unhealed. Everyone who is saved is saved in the Church. Whoever is separated from this Catholic Church --- however much he believes that he is living praiseworthily --- will not have life, but the anger of God rests upon him. The reason is this offense alone: that he is sundered from the unity of Christ. There are no greater riches, no greater treasures, no greater substance in this world greater than the Catholic faith. It saves sinful man, gives sight to the blind, heals the sick, baptizes catechumens, restores the penitent, helps the just, and crowns the martyrs. Hold fast, then, brethren, to the true, the genuine, the Catholic faith. This is our faith: the true faith, the right faith, the Catholic faith which comes not from private judgment but from the testimony of the Scriptures; not based on faltering heretical rashness but on Apostolic truth. The Church is the gate of Paradise, opened by Christ on Easter Day, through which believers alone may pass. There is nothing a Christian should dread more than to be separated from the Body of Christ, for if he is separated from the Body, he is not one of His members. If he is not a member of Christ, then he does not live by His Spirit. "If any man have not the Spirit of Christ," says the Apostle, "he is none of His" (Romans 8:9) ... Do you also wish to live by the Spirit of Christ? Then belong to the Body of Christ. No one ascends into Heaven except him who remains glued to Christ, for "no man hath ascended into Heaven ex- cept Him Who alone descended from Heaven: the Son of man Who is in Heaven" (John 3:13). Do you want to ascend, too? Then become a member of Him Who alone ascends! For He, the Head, is one man with the other members ... If, then, the Body of Christ and its members belong to "one man," do not make two out of them ... He is the Bridegroom Who is the Head, the Bride is he who is in the Body. For "they two," He said, "shall be in one flesh" (Matthew 19:5,6) ...And since no one can ascend into Heaven but him who has become His member in His Body, the saying is fulfilled that "no man ascends to Heaven except Him Who descended" ... What do these words mean if not that no man ascends into Heaven who has not been made one with Him and, as a member, become hidden within the Body of Him Who has descended from Heaven? And what is that Body if not the Church? If you are not in the Body, you are not under the Head ... He who does not have Christ for a Head cannot be saved; and he who does not belong to the Body of Christ, that is, to the Church of Christ, does not have Christ for his head ... The Catholic Church alone is the Body of Christ; the Holy Ghost gives life to no one who is outside His Body. It happens sometimes in the human body that something is cut off: a hand, a foot, a finger. Do you think the soul follows the part thus cut off? While it belonged to the body, it lived. Cut off, it loses life. So likewise the Chris- tian Catholic: while in the Body, he lives; becoming a heretic, he is cut off. For the Spirit does not follow an amputa- ted member ... the Body lives by one Spirit. Be watchful, therefore, brethren, within our own Body; and grieve for those who are cut off from the Church ... Now, if a member be cut off from the Body, does the soul follow after it? It can still be seen for the member it was: a finger, a hand, an arm, and ear ...but it has no life. So is it with a man separated from the Church. Heretics and hypocrites of every sort will be burned in the fires of Hell. The devil is not busy in pursuing infidels and such men as live outside the bosom of Holy Church, because he considers them already won. This is the Holy Church, the One Church, the True Church, the Catholic Church, fighting against all heresies. Fight it can; be fought down, it cannot. As for heresies, they all went out of it, like unprofitable branches pruned from the vine; but as for the Church, it abides in its Root, in its Vine, in its Charity ... Let us love our Lord God, let us love His Church: Him as a Father, her as a Mother; Him as Lord, her as His handmaid ...No man offends the one and wins the favor of the other. He will not have God for his Father who refuses the Church for his Mother. What does it profit you not to have offended your Father, since He will punish your offenses against your Mother? What does it profit you to praise the Lord, to honor Him, to preach Him, to believe on His Son and confess that He sits at the right hand of God the Father while, at the same time, you blaspheme His Church? ... No one can find salvation except in the Catholic Church. Outside the Church you can find everything except salvation. You can have dignities, you can have Sacraments, you can sing "Alleluia," answer "Amen," have the Gospels, have faith in the name of the Father, the Son, and the Holy Ghost, and preach it, too. But never can you find salvation except in the Catholic Church. Therefore, I believe it is good for me to praise the Chair and faith of Peter: with you alone remains uncorrupted the inheritance of the Fathers. As I follow no one but Christ, so do I therefore unite myself with Your Holiness, that is, with the Chair of Peter. Whoever eats the Lamb outside this House is profane; whoever is not in this Ark of Noah will perish in the Flood; whoever does not gather with thee scatters; that is: he who is not Christ's is Antichrist's! Without that faith, man cannot live piously and uprightly. Let us believe, that we may be saved. Unless we believe in Scripture, we can neither be Christians nor be saved. For my part, I would not believe the Gospel except as moved by the authority of the Catholic Church. Heresies ensnare souls and cast them headlong into Hell. Heretics, from the very fact of having left the Church, are damned. Heretics are rebels against God and His Church.